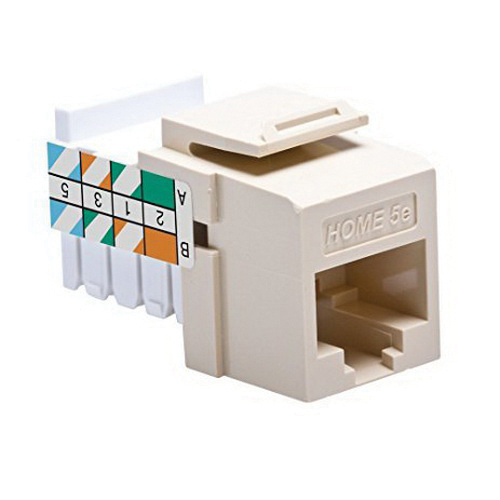 Leviton Home 5e® QuickPort® Cat 5e Modular UTP residential keystone jack connector is ideal for Gigabit Ethernet and 622 Mbps ATM. Surface/flush mountable jack connector in ivory color, features high-impact plastic construction. It has a dimension of 0.63-Inch x 1.18-Inch x 0.58-Inch. Connector allows 568A/B type wiring for improved functionality. It is V0 flammability rated per UL94 to withstand harsh environmental conditions. This connector offers reliable network connections for Cat 5e UTP structured cabling systems in a variety of residential applications. It is suitable for use in conjunction with other QuickPort® snap-in modules for a wide range of voice/data and video applications over UTP, coax, and fiber. Jack connector is cULus listed and meets ANSI/TIA/IEEE/ISO 9001 standards. * Inventory displayed is accurate as of 04/23/2019 14:40 EDT.